The Overview Page allows you to see from a single glance what’s going on in any village that you own. You can easily see which village needs your attention most, either because it’s attacked or because it doesn’t train any soldiers or has no buildings in the queue. We’ll take a portion of the above screenshot as an example. If you can’t understand the details, you can click on it to open it in a new window. The first line shows you the name and coordinates of the village. In this case, the name is ImperialAges and the coordinates are [2 | –7]. On the second line you will see 4 columns, with data concerning the current state of your village. First column – an image of your village, which is a standard empty village at the moment. Second column – displays how much resources you have stored in the warehouse and treasury of that village. First, you see an icon representing the resource. First row is wood, second is stone, third is iron and fourth is gold. The first number shows you how many resources you have stored, and the second number shows you the maximum capacity of your warehouse or treasury. Third column – on the third column you can see how much you produce each hour from the 4 resources of the game. In the screenshot above, you can see that the village ImperialAges produces 1900 wood/hour, 1900 stone/hour, 1300 iron/hour and 2950 gold/hour. Army: shows you how much gold per hour your troops consume in that village. 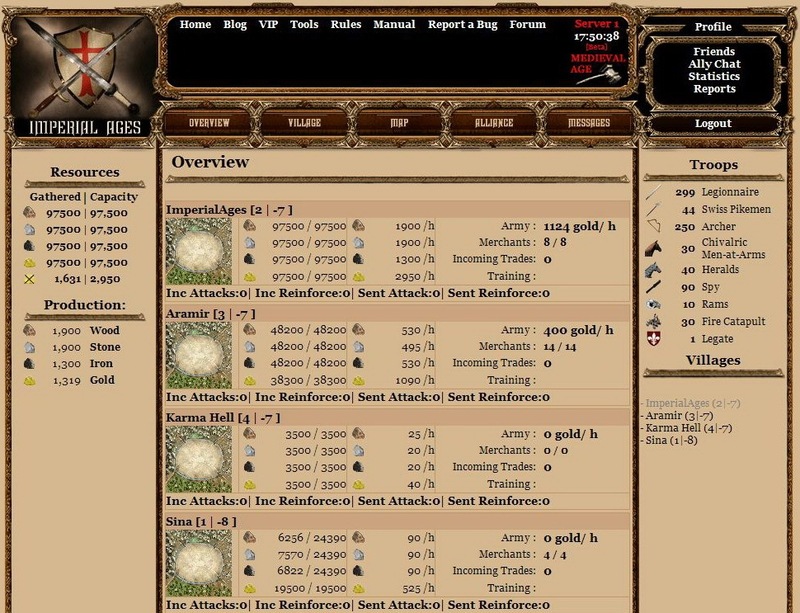 In this example they consume 1124 gold/h. Clicking on the consume will take you to the camping ground. Merchants: shows you how many merchants are idle and free to be used. If the number was 4/8, instead of 8/8, then they would be 4 available merchants out of a total of 8. Incoming Trades: shows you how many merchants are coming to your village with resources. 1 in this screenshot. Clicking on the number will take you to the Trade Office. Training: in this area, you will see small icons of the troops that are currently trained in the village. In the screenshot you can see that there are currently 3 types of units being trained in the village. Holding the mouse over the icons shows you how many troops are in training. Here you will see details about the troop movement from and towards your village. If you click on this line it will take you to the camping ground to see the details. Inc. 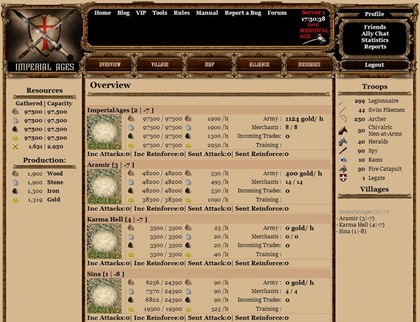 Attacks – incoming attacks or how many armies are heading your way, with intention to attack you. Inc Reinforce – incoming reinforcements or how many armies are coming to help defend your village. Sent Attacks – how many attacks are sent by you from this village that are currently travelling towards their destination. Sent Reinforce – how many reinforcing armies are currently travelling towards one of your allies, send from this village.